Being accused of a violent felony crime like assault and battery with a dangerous weapon is very disturbing, and I know you have questions. An accusation and criminal charge like this is scary. Criminal Charge in Massachusetts? Call Attorney Russell Matson at (781) 817-6332. Can I win in court? But many times, the facts and likely outcomes are nowhere near as bad as you fear. The worst case is bad, yes. The crime of Assault and battery with a deadly weapon (ABDW) carries a prison sentence of up to ten years or a $ 5,000 fine. ABDW is the aggravated version of the crime of assault and battery. The Massachusetts General Law provides the governance of the offense under Chapter 265, 15A. Cases that fall under assault and battery with a deadly weapon vary a great deal and may range from throwing a glass of water at someone else to a stabbing. However, the worst case is almost never the most likely outcome. And there are always legal defense options we can use on your behalf. Please call today, there is a very good chance we can help, and more importantly, calm you down as far as the worst consequences of what could happen. Very often, people feel better immediately after speaking to us. So call today and I’ll try to give you a little peace of mind, perspective, and optimism about your situation. Even a serious felony assault case like ABDW is absolutely winnable in court. We’ve had great success getting this charges dismissed, both at Clerk Magistrate’s Hearings and at Pretrial Conference sessions if you’ve already been arrested and charged. If you’ve received a citation to appear at a Clerk Magistrate’s hearing on this charge, we can represent you and often avoid a criminal charge from being issued altogether. In other cases, we can work out a deal where your record can stay clear after a short period of no further incidents. One misconception that most people have is that assault must involve contact. You may find yourself facing an ABWD charge when there was no contact with the alleged victim. Assault constitutes any action that presents an alleged imminent danger to another individual. Holding up a dangerous weapon against another person, even without touching them with it can be legally considered assault with a deadly or dangerous weapon. There must also be proof of risk of serious bodily harm for the prosecution to get a conviction of an ABWD charge. One way of doing that is showing a substantial risk of death occurred after the commission of the assault and/or battery. Another is proof of permanent disfigurement as a result of the assault. The loss or impairment of a member of the body can also be used to indicate severe injury. What is a Dangerous Weapon in an Assault Charge? The definition of a dangerous weapon in an assault and battery case is deliberately vague. In some instances like when there is the use of a knife, blunt instrument or gun, it is clear that the weapon is deadly. Legal professionals have to work with a broad interpretation of the law regarding what a constitutes a “dangerous weapon, ” and this is – any weapon that the defendant used under his control during the suspected commission of the crime and is likely to inflict bodily harm or cause death. Certainly, any illegal weapon present will result in this charge. But we have defended several of these charges where the weapon was simply a car. If you accidentally or on purpose drive near someone with your vehicle, your car can absolutely be considered a deadly weapon in that context. A “shod foot” will be considered a weapon in a felony assault with a dangerous weapon charge. Even objects that are in no way dangerous can be considered as such if thrown at someone. A wicker or plastic wastebasket, or other light object thrown toward someone’s head can be charged as “dangerous”. And just kicking someone instead of hitting them can result in the felony charge. The police will write up the weapon in the police report or charging document as a “shod foot”. So, yes, sometimes we actually get into the facts of exactly what footwear you were wearing at the time. If you had steel-toed boots own, that is a tougher case. If you were wearing moccasins or your favorite bunny slippers, then I think we have a pretty good argument on our side. As you can seem from this interpretation, any object that is used in a manner that causes harm to another individual can be termed as dangerous. How the defendant used an item during the alleged crime is what differentiates plain assault & battery and ABWD. What are the Penalties for Assault and Battery with a Dangerous Weapon in Massachusetts? A guilty verdict of assault and battery with a deadly weapon results in a maximum sentence of ten years in a state prison. Alternatively, you could end up in county jail or House of Correction for two and a half years maximum. A third option is a fine not exceeding $5,000. Note that you may get both the prison sentence and a fine. The difference between being incarcerated in a county jail and a state prison is that the latter is structured for violent offenders. Jail term cannot run more than 2 1/2 years. For the same offense committed against a person of sixty years or older, the incarceration terms are the same and the fine is a maximum of $1,000. If the defendant is a second offender of the same crime, then the sentence is mandatory and shall be for not less than two years. Also, the defendant shall not get a reduction of his/her sentence until after serving for two years. A person convicted of such a sentence is not eligible for parole, work release, good conduct release, probation, or furlough until after serving two years. Some elements in an ABWD case can lead to a judge giving a stricter punishment. The scenarios below can result in a sentence of ten years maximum, a fine of not more than $10,000, or 21/2 years in jail. The defendant caused serious bodily harm by assaulting the victim with a deadly weapon. The defense that assault and battery with a deadly weapon lawyer uses will depend on a lot of variables. An experienced attorney can find a way to have charge amended into a less severe one. You can also get guidance on whether to take a plea deal or take the case to trial. Never assume that assault and battery with a deadly weapon case is simple, and you can’t win. Please call us today to find out exactly how we can help. The consultation is free and confidential. Call Now for a Free Criminal Consultation. 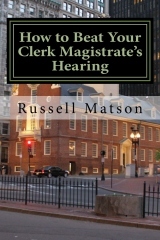 I wrote the book on winning your case at a Clerk Magistrate's hearing. Or just email me and I'll send you a copy. Don't really buy it. Just submit my web form above with your mailing address and we will send you one for free! No obligation. Do I need a lawyer for an arraignment? How Much Does a Criminal Lawyer Cost in Massachusetts?